Already slacking off my New Year's resolution on the blogging front- sharing more recipes- I'm finally able to get back on board with it after a much-deserved three day weekend after my first week back in school. This semester, disillusioned with dining hall fare after a long winter break filled with home-cooked meals, I knew that I'd have to expand my dorm cooking repertoire beyond pizza and baking. Cold weather had me craving green curry, but not wanting to venture out and spend the money for restaurant-made fare, I decided to take it upon myself to experiment in the kitchen. In a mere 20 minutes, the product of my limited cooking ability far surpassed my expectations and rendered a wonderfully satisfying meal that made the whole endeavor more than worth it. When it comes to allergen-free and gluten-free friendly dining in the Baltimore area, I cannot recommend One Dish Cuisine enough to locals and visitors alike. Thanks to this cafe and and the hardworking staff who keep it running, dining out can once again be a truly stress-free experience where all thoughts of cross contamination are tossed aside because the premises is free from nine known allergens (more info in picture). Their mission of welcoming everyone "back to the table" regardless of their dietary needs is realized each and every day as people flock from near and far to enjoy great food without fear. Though I have visited One Dish Cuisine before (see my review here, and here) for lunch and baked goods, I have always wanted to stop by for breakfast. As of early December of last year, One Dish Cuisine expanded their service to seven days a week, so I mad a point of dining there on a Saturday morning before moving in to my dorm. Since I've been on a baking kick this winter break, I have been sampling an array of recipes and mixes. A quick shopping trip to Target introduced me to the colorfully packaged baking mixes from Immaculate Baking Company. Finding the simple ingredient list and promise of no artificial preservatives or flavors irresistible, I grabbed a box each of their double chocolate and chocolate chip cookie mixes and put them aside for those times when I want a sweet treat but do not have the time or energy to prepare cookies from scratch. Both mixes require minimal additional ingredients, just oil, eggs, and vanilla (for the chocolate chip cookies) and come together in a flash. Immaculate Baking Company, the company behind these cookies is on a mission to bring homestyle, wholesome cookies to the masses and prove once and for all that baked goods made with real ingredients can and should be the norm- not the exception. After finding and falling in love with a 100% dedicated gluten-free restaurant and bakery in the Melbourne (The Bald Strawberry), my dedicated gluten-free adventure was far from over when I realized that the bakery portion of the experience was a two-for-one deal. Sharing the same retail space as the Bald Strawberry's Bakery, Flour and Spice Boutique is another dedicated gluten-free business that serves up plenty of sweets to satisfy any sweet tooth. The woman behind this culinary boutique is dedicated to creating truly exquisite baked goods from organic, quality ingredients. After polishing off one incredible waffle pizza at The Bald Strawberry Cafe in Melbourne, I was pointed a few paces down the strip mall where the cafe was located to their bakery. That's right: not only is the Bald Strawberry a 100% dedicated gluten-free cafe, they also have an adjacent bakery to satisfy all of your sweet tooth's wildest dreams. Once my initial amazement and delight washed over me, I set in to see what gluten and dairy free treats I could sample and try. I knew it would take some serious self-restraint to leave there without a car full of goodies given that I could only buy as much as would last me the day or two as I didn't want to risk destroying the baked items in transit to Maryland. When it comes to "eating out without" gluten and dairy, I've sampled restaurants that run the gamut from 100% gluten-free to gluten-filled establishments that serve gluten-free fare on the side. Given the choice, I'd choose a dedicated gluten-free establishment any day! With only 48 hours left in my winter break, I wanted to make the most of my time left, and decided to venture beyond my Central Florida comfort zone to Melbourne to check out The Bald Strawberry, a dedicated gluten-free cafe recommended highly by several members of the private Gluten Free in Orlando Facebook group where I have picked up some valuable tips on where to grab gluten-free fare around the city. Lured by the promise of gluten-free waffles and pizza, two of my favorite foods, my mom and I decided to make that our last "girl's lunch out" before officially leaving town. I am now counting down the days until I make my return to the great state of Maryland and my second home town of Baltimore. With less than a week to go until I trade in the pristine perfectness of Florida winter for the harsh reality of the colder climate up north, I wanted to make the most of my final week and jumped at the chance to meet up with friends and fellow bloggers Alexis (from Gluten Free in Orlando) and Sarah (from Gluten Free and Dairy Free at Walt Disney World). After deliberating what meal to have (breakfast? lunch? brunch? dinner? ), and where to go (with Disney's multiple possibilities), we decided on Raglan Road Irish Pub and Restaurant in Downtown Disney- make that Disney Springs- for brunch. Having loved this restaurant as a kid as it was one of my family's favorite places to take out-of-town guests, I had pretty high expectations and couldn't wait to come back and rediscover them all over again. After my initial visit to Diagon Alley and success with finding gluten-free and dairy-free options at the Leaky Cauldron for lunch, I knew I had to go back once I discovered that the signature restaurant serves up breakfast- including gluten-free pancakes. As it happens, gluten-free pancakes are one of my favorite breakfast foods. However, I didn't get my hopes up right away as I knew that dairy could easily spoil the possibility of these pancakes for me. However, Chef Bob in the special diets department, green lighted the breakfast specialty via email as he confirmed that they do not, in fact, have dairy or gluten. The Leaky Cauldron only serves breakfast until 10:30 am so those wanting a magical start to the morning should plan to be there first thing. Taking advantage of the MLK holiday weekend, I arrived at the park thirty minutes before it's "official" opening time (9:00 am) to be sure that I didn't miss out on the breakfast menu, and made a beeline to Diagon Alley. Figuring that I've done pretty comprehensive coverage of the Wizarding World of Harry Potter in both Universal Studios and Islands of Adventure, I decided to venture elsewhere in the park for lunch on my third visit. Passing several times through the Simpsons-themed land when going to and from Diagon Alley, a bright black-and-yellow food truck caught my eye and sparked my curiosity. After all, it's hard not to miss the larger than life bumblebee head sitting atop the quick service stand. This bee, well, Bumblebee Man as he is known, is a recurring character in the long-running show. Although I am not a big fan of the Simpsons, I do enjoy the biting and cheeky humor that is lavishly woven into this section of the park. From "Lard Lad" doughnuts to the "Twirl 'n' Hurl" kid's ride, the laugh-out-loud details are a delight for adults, yet subtle enough to pass over kids' heads. When it comes to Farmers' Markets, Central Florida certainly has an abundance of options when it comes to these showcases of local produce and other products. In my previous Farmers' Markets adventures, I have found gluten and dairy free options at both the Maitland Farmers' Market and Lake Eola Farmers' Market (see restaurant directory above). I knew immediately that I had to head north of town upon discovering The Bite Bakery, an up-and-coming cookie company that features allergen-friendly, vegan cookies "with a conscience" at the Sanford Farmers' Market. Needless to say, I was sold on their premise and mission, and am eager to check out and submit myself for a taste test or two. The "bite" of Bite Bakery comes from a fateful spider bite that forever changed founder Natasha's life. That one encounter triggered an immune response that resulted in several suddenly acquired food allergies. Missing her favorite treat- a cookie- she channeled her baking expertise into producing allergen friendly cookies anyone and everyone could enjoy. After a busy weekend theme park-ing with my dad and immersing myself in all things the Wizarding World of Harry Potter, I was looking forward to a change of pace with my aunt coming down. Both tired after a busy weekend and feeling uninspired by our barren fridge, I decided to propose lunch at a cafe near downtown Orlando that I've been wanting to do for a while: Bikes Beans and Bordeaux. This neighborhood cafe does indeed feature bikes (the pedal-pushing kind), beans (of coffee variety), and bordeaux (no explanation required) as well as a wonderfully lengthy and diverse menu spanning breakfast, lunch, and dinner. Part of the whole fun of Diagon alley is that the open marketplace is prime for people watching. Witches and wizards of all ages cast spells with their interactive wands and impressive costuming efforts blur the line between employees, wizards, and muggles in disguise. After a busy morning of shopping, I wanted to take a quick rest stop at the Hopping Pot, an outdoor bar that features an array of alcoholic and non-alcoholic brews guaranteed to please every palate. Universal Orlando, in developing the richly layered and immersive Wizarding World of Harry Potter, won worldwide fame as they became the one and only destination (in the muggle world) where anyone and everyone can get butterbeer: the non-alcoholic butterscotch beverage made famous by J.K. Rowling in the Harry Potter book series. As fans flock to the park in search of this magical drink, they often overlook other offerings found exclusively at Diagon Alley that are equally as mystical and delicious. Especially for those with celiac disease, food allergies, and intolerances, whose limited diets, these alternative drinks provide opportunities to get in on the fun without having to risk getting sick for a simple taste or watch from afar as others consume the drinks without worry. This list is not completely comprehensive but covers the main drinks served in this section of the park. Now that I've covered the Wizarding World of Harry Potter's two main eateries- The Three Broomsticks and The Leaky Cauldron- I figured it was time to delve into the sweet treats found in shops in both Diagon Alley and Hogsmeade. For fans of sweets of every sort, there's plenty of products to go around from chocolates to gummies, and hard candies to licorice. This post is not a review, but a listing of the sweets I found at Honeydukes in Hogsmeade and Weasleys' Wizarding Wheezes in Diagon Alley. Some are found at both establishments and some are store-exclusive. I have missed a few of the treats on this list since the crowded shops make maneuvering in a wheelchair rather difficult, but I will make amendments on repeat visits. While these candies are exlcusive to Universal Orlando, you can order a few online if a trip to Orlando is not in the near future for you at this link. Stopping by the Three Broomsticks on my way from London's Diagon Alley to Hogsmeade village and Hogwarts, I knew I had to stop by the Three Broomsticks for a bit of refreshment after the long train ride. For those of you you who have no clue what I'm talking about, stick with me. The Three Broomsticks is a restaurant/pub featured in Harry Potter's Wizarding World that was brought to life in 2011 at Universal's Islands of Adventure (for further Harry Potter cannon explanation, try Google!). Upon visiting for a quick lunch, I discovered that the restaurant has a dedicated allergy binder covering both gluten-free a dairy-free options as well as the other major 8 (and some additional) allergens. The Three Broomsticks is open for breakfast from the park opening until 10:30 am and then serves lunch/dinner fare through the park closing. For my full review and additional information, click here. Having previously stopped for lunch at Diagon Alley's Leaky Cauldron, I knew that one of the top spots on my "to-do" list for future visits was a meal at the Three Broomsticks in Hogsmeade, the little village nearby Hogwarts that (in the muggle world) is located in Universal's Islands of Adventure park. I have eaten a meal at the Three Broomsticks once before as a gluten/dairy eater and have stopped by for a butterbeer several times before getting sick (it's a nice way to beat the long lines waiting in the elements at the outdoor butterbeer dispensaries). Just as the Leaky Cauldron is the lone restaurant in Diagon Alley, the Three Broomsticks is your only option for "real" food in the magical village. You can have only so many butterbeers and Honeyduke's treats before needing a nice square meal to soak up all the sugar, so the Three Broomsticks' offers up hearty British fare featuring dishes both familiar and not. Once ordering, the Three Broomsticks offers much more than food and valuable air conditioning as glimpses of magical mischief can be seen in the shadows, nooks, and crannies of the old pub where Harry and the gang had their first butterbeers. If you look closely, the sign actually leaks! I'm not going to lie- living in Orlando definitely has its perks. Namely, the vast array of dining venues, attractions, and experiences you just cannot get anywhere else. While I like Disney and SeaWorld as much as the next person, I must admit that my heart truly belongs to Universal Orlando Resort of the "big 3" as they are home to the two-part Harry Potter experience that can only be seen to be believed. 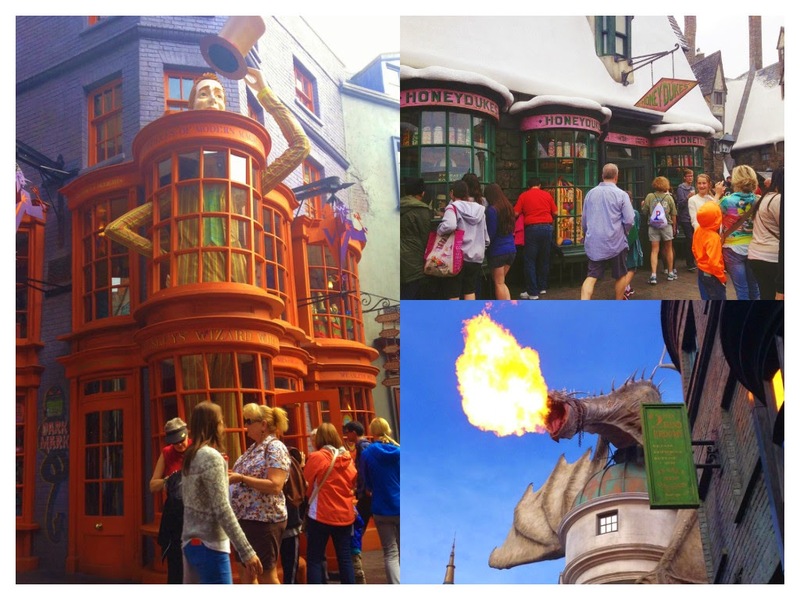 The "lands" have a presence in both the Universal Studios park and the Islands of Adventure and bring to life the experiences of our favorite boy wizard and the magical civilization dreamed up by J.K. Rowling. Although I have been to the original Hogsmeade village which opened in 2010, I have not been in over three years and have not been with gluten and dairy intolerance a major factor in my visit. With the opening of Diagon Alley last year, I knew that I'd invariably have to make the pilgrimage there during my winter break as January is a nice time to do the parks after the mad rush of the holiday season. Diagon Alley's sole table service restaurant is the Leaky Cauldron, and arriving to the park around lunch time, I felt the timing was perfect for trip to this London landmark. On the coldest day of 2015 (so far) in the sunshine state, there's only one way to remedy the chill in the air: a nice steaming bowl of Vietnamese pho. After discovering the magic of pho in Orlando's heavily Asian Mills 50 District, I was determined to make a return visit to scope out more gluten-free options. With my mom and a neighborhood friend in tow, we set our sights for Pho 88, a critically acclaimed, yet unassuming restaurant on Mills Ave. Routinely topping local best-of lists, I must admit that my expectations were pretty high. Arriving shortly after noon, the restaurant was not packed, but was definitely busy as others seemingly had the same idea as we did. Normally one to avoid sweets as I easily get debilitating sugar headaches when I eat too much, my recent surge of eating cookies, pies, and other treats this holiday season has rendered my sweet tooth a little out of control. Now that the festivities and frivolities of the holidays have come and gone, I join the millions of other people who resolve to eat, live, and just be better in 2015. Topping my list of resolutions for my blog this year is testing and sharing more recipes that are easy for college students, teens, or anyone who fears complicated gluten and dairy free recipes with lengthy ingredients lists that are expensive and exotic. My favorite meal of the day is breakfast, and one of my favorite morning treats is muffins. Searching the internet for muffin or breakfast cookie recipes that were minimally sugared yet involved a hint of chocolate to appease my sweet tooth I ventured into paleo baking for the first time. Naturally gluten, grain, refined sugar and dairy free, the paleo diet's parameters proved to be exactly what I was searching for. In a whirlwind, December has come and gone and left us with the bright, shiny hope of a new year filled with new possibilities. While not one to dwell in the past, one of my last blogs of 2014 is my month-end round-up of gluten and dairy free products that caught my eye. While I discover and showcase new products throughout the year, the ease of access to my favorite grocers such as Whole Foods, Fresh Market as well as local stores such as Hoover's Market has greatly improved during my hiatus from collegiate life over the holidays. This round-up, while longer than usual, has some great products that I am very excited to showcase. Sweets, breakfast foods, and nuts caught my eye this month leaving a little something for everyone. After discovering the comfort food and study fuel properties of pho last year during my final weeks in Maryland, I could not wait to come back to Orlando in search of this Vietnamese delicacy. After spending New Year's Eve a little sick and left out of my family's tradition of Italian food, I wanted to start 2015 on the right foot with a steaming bowl of broth and noodles. Re-branded as the Mills 50 district and formally known as "Little Vietnam," it is hard to miss the 10 block of Asian grocers, restaurants, and shops that line Colonial Drive near Mills Ave. Despite the proliferation of pho restaurants, a lack of information on gluten-free friendliness prompted me to crowd source information from the gluten-free in Orlando Facebook group. After several suggestions, I decided to go for Little Saigon for their expansive menu that would be sure to please not only my pho cravings but the varied tastes of my gluten-loving mom and sister who were along for the adventure. After finishing my list of my top 10 picks of gluten-free friendly restaurants, cafes, and bakeries in Baltimore, I knew the next task at hand would be to construct a parallel list for Orlando. A much taller order due to the sheer variety and number of establishments I've reviewed in my nine months of blogging, I now present this list of my personal picks for 2014 with pride. The restaurants, cafes, and bakeries that made this list are noted for their outstanding attention detail when it comes to gluten-free and allergen-friendly protocols as well providing great service and delicious food that proves why this city is quickly becoming a gluten-free foodie's fantasy land. As Orlando rings in 2015, what new eateries are you looking forward to trying out and which made your personal best-of list? Comment below!